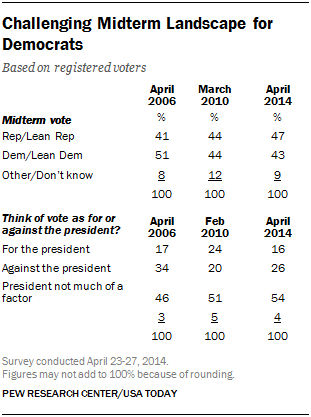 Republicans are no more likely to consider their vote as “against” the president than they were in early 2010 (46% today, 42% in February 2010). But Republicans typically vote at higher rates than Democrats in midterm elections. 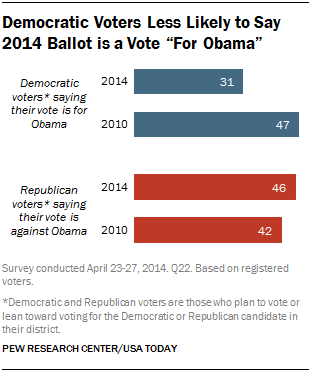 Democratic voters’ lack of enthusiasm for Obama may complicate Democrats’ turnout efforts. In late April 2010, Obama’s job rating was slightly more positive than negative (47% approve, 42% disapprove). Obama’s rating varied little over the remainder of the campaign four years ago. Obama’s current approval measure is much higher than George W. Bush’s at this point in the 2006 midterm, and Obama is less of a drag on his party’s midterm prospects than Bush was. In April 2006, Bush had a 35% job rating and twice as many voters considered their midterm vote as an expression of opposition to the president than as a signal of support (34% to 17%). Yet the public’s desire for a change from the president’s policies is almost as widespread as it was during Bush’s second term. Thinking about the next presidential election, 65% would like to see the next president offer different policies and programs from the Obama administration while 30% want Obama’s successor to offer similar policies. 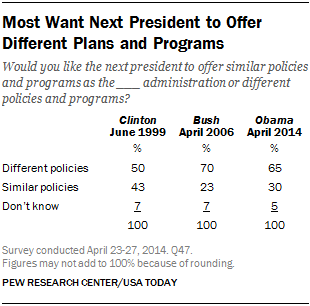 In April 2006, 70% wanted the next president to have policies different from Bush; 23% wanted similar policies. By contrast, in June 1999, at a later point in the Clinton administration, just half wanted the next president to pursue different policies. While Democrats face a number of possible disadvantages in the fall, their party’s congressional leaders continue to be viewed less negatively than GOP leaders. Just 23% of the public approves of the way Republican leaders in Congress are handling their jobs while nearly three times as many (68%) disapprove. Job ratings for Democratic leaders, while hardly robust, are not as bad: 32% approve of their job performance while 60% disapprove. Despite weak job ratings for Republican leaders, the public is divided over whether their economic policies or Obama’s would do more to strengthen the economy over the next few years. 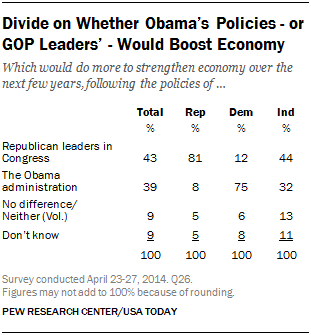 About four-in-ten (43%) think Republican leaders’ policies would do more for the economy while about the same share (39%) says Obama’s policies would be more effective. Economic Pessimism Persists. The survey was conducted before Friday’s jobs report, which showed that the unemployment rate had fallen to 6.3%, its lowest level since 2008, and that the economy had added 288,000 jobs. However, more than 800,000 people left the labor force. 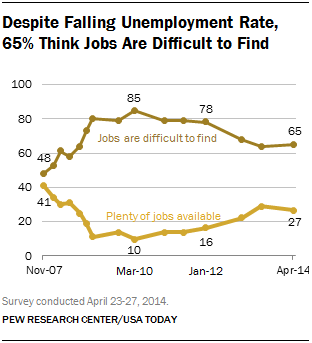 From the public’s point of view, jobs remain scarce: 65% say jobs in their community are difficult to find while 27% say there are plenty of jobs available. Since the recession, perceptions of the job market have become less negative as the unemployment rate has declined. However, there has been virtually no change in these views since last June (64% jobs hard to find), although the jobless rate has fallen by more than a percentage point (from 7.5% to 6.3%) since then. Moreover, there has been no increase in economic optimism. About as many say that economic conditions will be worse (24%) as better (25%) a year from now, with 49% predicting little change. Asked to describe the economic recovery, 66% say the economy is recovering but not so strongly, 26% say the economy isn’t recovering at all, while just 6% think the economy is recovering strongly. Views of ACA Little Changed. As other recent national polls have shown, including the April health care tracking survey by the Kaiser Family Foundation, the recent surge in signups for the new health care exchanges has had little impact on public opinion about the Affordable Care Act. In fact, the share disapproving of the law (55%) is as high as it ever has been in the four-year history of the law. Just 41% approve of the 2010 health care law. When asked about the health care law’s future, 49% of Americans say they think the law’s major provisions are probably “here to stay” while 43% say they probably will be eliminated. As expected, opinions about the law’s fate are linked to underlying views of the ACA. Still, about a quarter of the law’s supporters (27%) say its major provisions may be eliminated, while 67% say they are probably “here to stay.” Conversely, a third of ACA opponents (36%) say key aspects of the law will likely remain in place; 55% expect them to be eliminated.